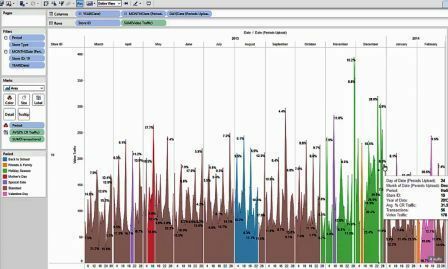 How to Compare Retail Stores KPI? Retailers compare stores with 3 Key Performance Indicators (KPIs) of Sales Comp, Sales per Square Foot, and Sales Conversion. Key Performance Indicator (KPI) measures the ability to achieve a core business objective. 5 factors of performance include sales, product, workforce, operations, and demand. There a specific retail metrics for each area of cost and operations, but the store’s performance starts with the ability of the store to transform sales opportunities into actual revenue. Sales Comp often refers to Year-Over-Year Sales Comparison of the same store. It points to the financial value of the local store to the retailers. But the rise of Omnichannel and Unified Commerce strategies create a challenge in evaluating bricks-and-mortar stores. Sales Per Square Foot (SPF) is the average revenue the store generates for ever square foot of sales floor. SPF is often used to evaluate the store for InStore Customer Analytics. Sales Conversion is the ration between buyers and browsers. It represents the ability of the store to translate sales opportunities into revenue. Sales Conversion quantifies the ability of the store to convert people who entered the store (Visitors) into buyers (Transactions). … for a retail store to perform FIRST it needs foot traffic! People Tracking Technologies generate Location & Time-Based data; it means we track the location of customers, and how long they stay. Therefore, our first step is to count how many people visited the store. Foot Traffic is the metric that measures sales opportunities. It counts the number of people entering the store, per period of time. The store’s foot traffic is the beginning of the In-Store Sales Funnel. Anonymous Location Analytics quantifies the actual demand of the local store! Regardless of the tracking technology, solution provider, and data quality, the analytics of location-based data requires a framework. The objective is to segment stores, identify laggards, and winning stores. Many retailers and solution providers tend to set arbitrary targets based on financial performance. And a common bad habit is to use AVERAGE KPI. A common practice ranks stores from top-to-bottom in a linear list. The Average Sales Conversion sounds like a simple number but it does not capture the local environment of the store. Moreover, the Average KPI is NOT an Actionable Insight. How do we define a “winning” store? How do we “align” the store’s staff incentives? How do we “improve” store performance? A better way is to segment stores and target outliers. Sales Comp is the most often used Store’s KPI. Other metrics include Inventory Turnover, Average Order Value, and Sales Conversion. But these metrics do not stand alone; they should be defined in context. With regression analysis, we see a connection between the traffic and conversion. The stores with low foot traffic have the higher conversion rates. And those retail stores with high-volume visitors have a lower sales conversion. Traffic and Sales Conversion have an inverse correlation! When Service Intensity is low (visitors to staff ratio), customers get better service (salespeople have more time to help each customer). At the same time, there is a diminishing margin to adding salespeople. To compare Sales Conversion, you must control for foot traffic. How to quantify the Sales Opportunity for Physical Stores? Actual Demand to a store is measured with Foot Traffic. A store averaging 3,000 weekly visitors does not operate the same as a store with 500 weekly visitors. Counting footfall traffic also clarifies the fine line between Marketing and Operations. The responsibility of corporate marketing is to bring visitors to the store. While Operations is tasked with transforming visitors into buyers. Geography is much more than just a location… to better segment our stores we need Demographics. Next, we look at the stores themselves. Like a jury of your peers, retail stores should also be evaluated against similar stores. The main reason lies with the Customer’s Intent to Buy. Retail metrics such as Foot Traffic, Sales Conversion, Proximity Traffic, Average Order Value, and Loyalty Membership, paint a picture of how customers relate to the retailer. But the nature of the store is a good place to start. Destination Stores: Big Box Stores are usually Destination Stores. Examples include Walmart, Costco, and Home Depot. In such stores, a customer visits the store with a high intent to buy. Standalone Stores: Stores located in High Street are usually standalone stores. Most are boutiques. Standalone stores tend to have the retailer’s highest Sales Conversion Rate. Mall Stores: Shopping Centers can be divided into Tier-1 Malls, Lifestyle Malls, and Outdoor Malls. Regardless of the classification, the location and positioning of the shopping center have a profound impact on mall analytics. Mall stores with 1 entrance: Most mall stores do not have the destination factor. Therefore, they are subjected to the rigors of sales conversion and location analytics. Mall stores with 2 or more entrances: When a mall store has at least one door to the parking lot, the foot traffic includes people passing by from the parking lot to the mall. This behavior lowers conversions. Retailers can have a wide variety of Conversion Rates. Standalones are at 50% to 60% Conversions. Mall Stores with single entrance are around 30%. And Anchor Mall Stores may have 10% to 20% Conversions. Multiple Targets KPI per store segment aligns staff compensation to the actual store performance. In addition to data quality, data consistency is critical. 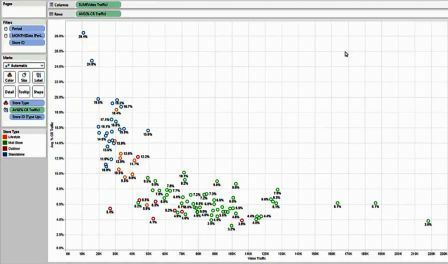 In retail stores comparison, Time Period create a context in the analysis. 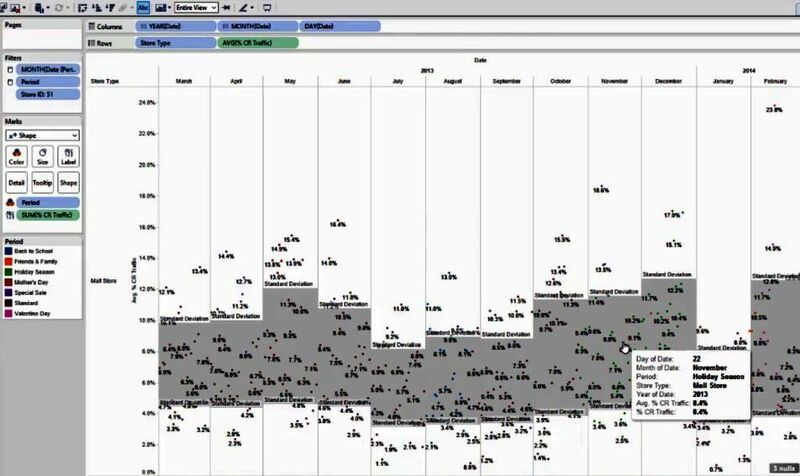 In Year-Over-Year reports, pay attention to the data consistency of Time Periods! It may be straightforward to compare Week #29 to the previous year Week #29, but holidays, storms, and other events can challenge the consistency of the comparison. Some retailers make over 50% of their annual revenue during the holiday season. Back-To-School sales used to start at Mid-August. Now they start on the last day of school. Alibaba made November 11 into a retail fantasy. Amazon quickly followed with Prime Day. Retailers are always looking for a reason to entice customers to shop. When we analyze store performance we must take these events into consideration. But a year-over-year analysis will have errors unless we compare in context. To compare holidays and seasons, start at the end date and work backward. Calendar: In 2008, Easter Sunday was on March 23. In 2019, the holiday was celebrated three weeks later on April 12. Trends: And a holiday can impact 2 to 6 weeks of revenue before the actual date. Also, much depends on timing and scope of marketing campaigns. Brands: Holidays have different weights of importance. Some retailers generate half of their revenue during the Christmas Season. Jewelry stores thrive during Mother’s Day. Summer is especially important for Garden Products. And Back to School is important for retailers selling school supplies and socks. And to complicate the comparison more… we must speak about the weather. Weather wreaks havoc on retailers. It’s both a disaster and an opportunity. In the blizzard of January 2011, stores in Northeast lost 40% to 50% of traffic. Hurricane Andrew smashed through South Florida. And yet retailers have adapted. By 2017, Hurricane Rita rampaged the Caribbean Islands but in South Florida, the retailers were prepared. Home Depot has a built-in plan for shipping certain supplies like generators and water. Our local supermarket chain has contingency plans for stores opening within hours after the storms pass. Extreme weather events are data outliers. Weather also distorts the year-over-year analysis. In such outlier events, the retailers can adapt the reports to traffic trends, or not. Either way, the data policy should be transparent. Outliers are how we identify winning and non-performing stores. To improve store performance, the stores need access to data. And if the analysis is done correctly the stores will be aligned with corporate policies. In the first 3 months of data, identify the baseline. In the first year, segment the stores and define the Target KPIs. 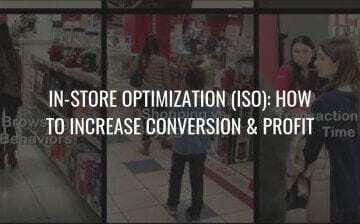 The next stage is optimization projects and In-Store Customer Journey. And always judge a store against its own self-improvement. “The way you introduce a technology into the store is just as important as the technology itself. – Anonymous VP Stores ”. If you spend as much energy and money on technology expertise, but does your customer know how to use the data? The analytics of store comparison is about alignment between corporate policies and incentives to the stores. With data, we can clarify the lines between Marketing and Store Operations. With store segmentation, we can create Target KPIs. And compare foot traffic and sales conversion to identify the store’s performance in context to demand and operations.